Road Trip to Chichén by Way of Cobá, Day 1 — Time is Money | Cardinal Go! 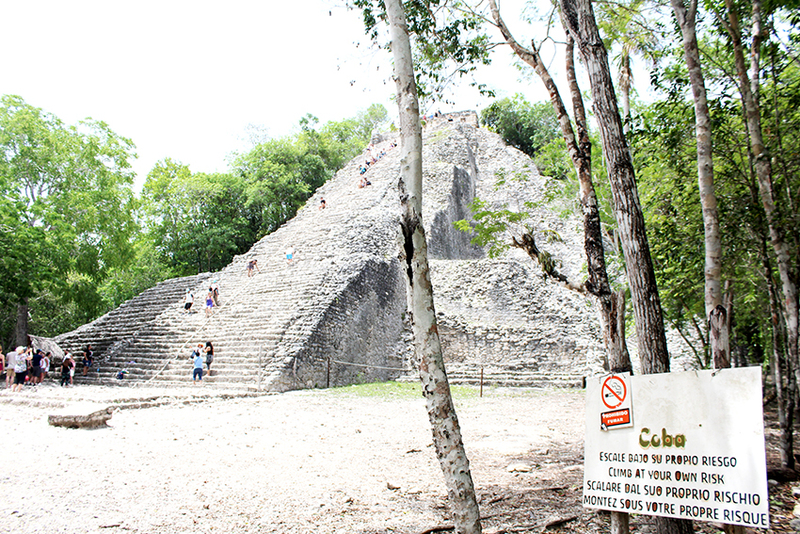 Climbing to the top of Cobá’s Nohoch Mul pyramid is a great prelude to your exploration of Chichén Itzá. No matter how much you try to save a few pesos on your road trip to Chichén Itzá, it’s gonna cost you. If not in cash, in time it takes to cut corners — by that, I mean taking desperately slow rural roads rather than the tolled freeway. But the good news is, the slower journey is totally worth it! Weeks after our road trip to Chichén, I’m still daydreaming about the path we took by way of Cobá, then to Valladolid’s downtown, and eventually to the world-famous Maya ruins. My in-laws were visiting from Russia and were about to return home after almost two months with us in Cancún. It was their penultimate Saturday in the Yucatán Peninsula, so we’d planned to go refresh in the Zací cenote in downtown Valladolid. Then by evening we’d be in our hotel outside of Chichén Itzá. The plan was to visit this “New 7th Wonder of the World” on Sunday morning, before paying tribute to the tall pyramid at Cobá later the same day. That’s because Mexican citizens and permanent residents enter any archaeological ruin in Mexico for free on Sundays, so I’d only have to worry about paying my in-laws’ entrance fees. We figured, that’s a whopping 285 pesos ($15.50 USD) we’re keeping by avoiding the tolled Cancún-Valladolid freeway. The two-lane road was fairly smooth for about 20 miles from the outskirts of Cancún to the town of Leona Vicario. Then we slowed down for a few speed bumps, but continued going through several smaller “ejidos” and nice views of properties inside the jungle. The slower road from Cancún to Cobá is bipolar — too many speed bumps, but even more incredible views of Maya jungle flora and peaceful “ejido” communities. Suddenly, the Maya gods told me to stop our road trip to Chichén Itzá. Before crossing into Yucatán state and hitting the town of X-Can, I made a right turn southward to Nuevo Durango. Actually, it wasn’t the ancient deities; rather, more practical logic prevailed. For more than an hour, our car’s driving rhythm became bump-bump……………..bump-bump….bump-bump……………………..BUMP-bump. The constant stop-and-go made it obvious why taking the freeway is actually worth forking over 285 pesos. After seeing a few signs pointing to Cobá from Nuevo Xcán, and confirming with the GPS how close we were, I changed the course of action. A view of Nohoch Mul, one of the tallest Maya pyramids at 137 feet (42 meters). Climb Cobá’s Nohoch Mul pyramid while you can! You can’t climb Chichén’s ruins, after all. So the money I would’ve spent on the tollbooth went toward my family’s entrance fees to Cobá that Saturday. It was about 70 pesos per adult. For the 7+ months we’ve lived in Cancun, we’d heard so much about how great Cobá is and how it’s more impressive than Chichén Itzá in many ways. Indeed, this ancient Maya city houses some of the more inspiring ruins I’ve visited in Mexico — the crown jewel being the 137-foot-tall Nohoch Mul pyramid. When we entered the archaeological site, we were greeted by plenty of shade from the jungle canopy over the “sacbes” — the roads pioneered by the brilliant Maya engineers. That’s another advantage over the other better known Maya ruins — shade goes a long way when temperatures top 90º Fahrenheit. There’s plenty of walking on the shaded “sacbes,” and the Cobá site administrators know how to capitalize on it. That’s why they offer bicycle rentals and bike taxi rides across the expansive site. Lots of walking in Cobá, hence people rent bikes to traverse the “sacbes” — Maya roads. We passed on renting bicycles and got plenty of walking until arriving to the Nohoch Mul pyramid. The greatest attraction of this towering temple is that you can actually climb it. Unlike Chichén Itzá’s Temple of Kukulcán, which no longer allows human footsteps upon it (more on that in the second part of this blog post). At first it might seem intimidating to see dozens of tourists climbing the pyramid and supporting themselves with a thick rope as though it were a handrail. But once you take the first steps, you feel like the Maya gods are pushing you all the way to the top. The missus bravely climbed these steps, and was rewarded with these awesome sights. The tourists also revel in the picture-perfect views of the Maya jungle. Thankfully, no one dropped their phone. No doubt about it, the apex of Cobá was one of the highlights on our road trip to Chichén. Stelae — stone slabs that illustrate great moments in the Cobá kingdom’s history. When we walked back to the main entrance, we were quite exhausted and had contemplated taking a bike taxi. Once again, it’s either time or money you spend on these ruins. Nevertheless, we were ready to refresh, and a few “paletas” (ice pops) were the cure. But the main fix was at a cenote, a natural sinkhole that’s part of a network of underground rivers flowing throughout the peninsula. The Zací cenote is right in the middle of downtown Valladolid, deep in its underbelly. It was still early afternoon when we left Cobá, passing through its main lagoon. This time, the ride on “La Libre” was thoroughly smooth — as it should, given that tour buses and private transfers depend on comfortable rides for their paying customers. We made it to downtown Valladolid in less than an hour. Our main objective was to get in the water of Zací cenote. We’ve visited other cenotes in Riviera Maya before, but Zací has its own special splendor considering it’s well preserved in the depths of Valladolid’s downtown. Before the Spaniard conquest, Valladolid itself was named “Zací,” which is Mayan for “white sparrowhawk.” The entrance fee to the cenote is about 30 pesos per adult, and you can rent life jackets if you choose. A panoramic view of the mystical Zací cenote. When we got out of Zací, we continued our journey to our hotel outside of Chichén. The road continued being beautiful. Stay tuned for the second part of this exciting two-day adventure!